Hilton Digby, left, and Vern Jensen demonstrate the wood bending process in the making of wooden wheels for a Model T Ford vintage car. 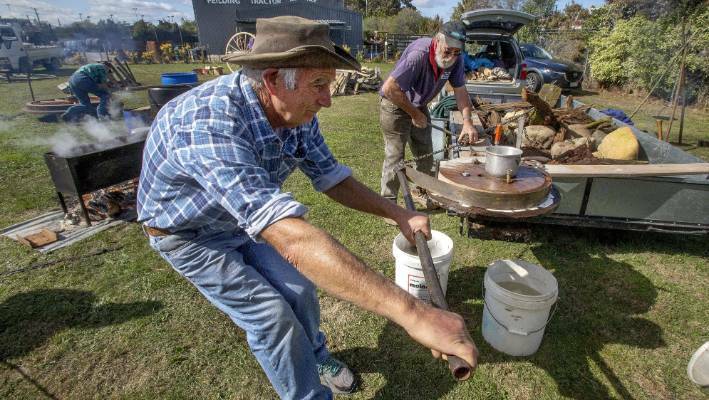 History has come to life in Feilding, as skilled craftspeople demonstrate the trades that helped build the Manawatū region. Weavers, wheelwrights, blacksmiths, shearers and more shared the secrets of their art for Old Skills in Action at the Coach House Museum on Sunday. 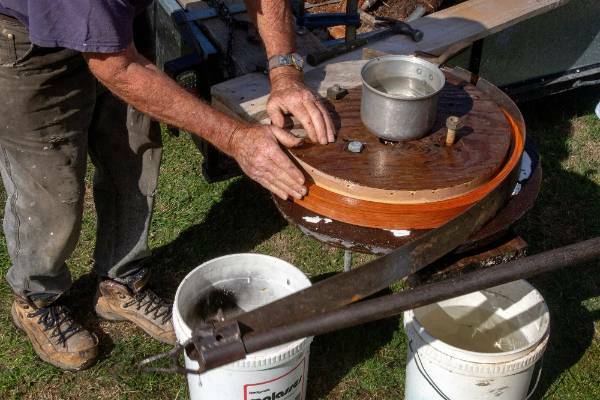 Feilding wheelwright Vern Jensen is one of a handful of people in New Zealand still making wooden wheels for vintage cars. He eagerly shared his knowledge with a curious crowd throughout the day, while making Model T Ford wheels. 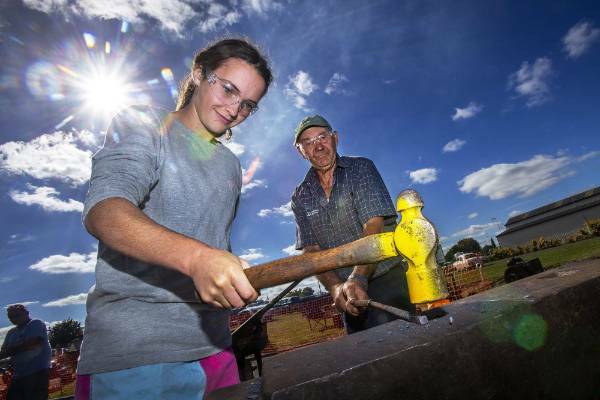 Lucy Brown from Feilding takes a hammer to shaping a red hot steel rod on the anvil under the watchful and instructive eye of Brian Schnell from Bunnythorpe. 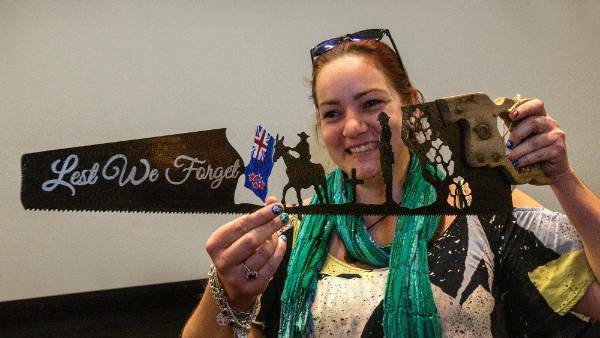 Rose Frear of Palmerston North with one of the dozens of designs she shapes into old wooden handled saws using a hand-held plasma cutter. Ray Haydock (centre) demonstrates Ratosaurus, his remote controlled steam punk racing teapot. 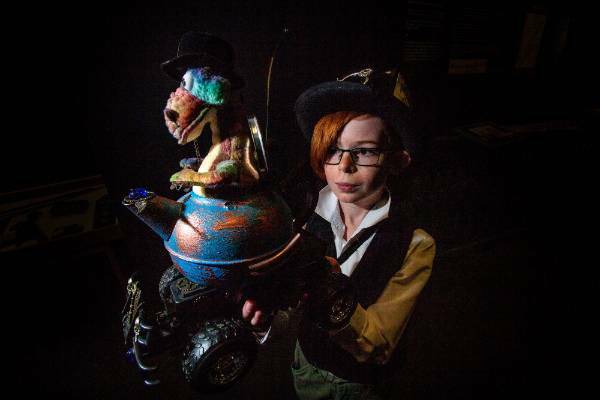 Liam Shirriff, 10, from Woodville dressed for the occasion in his steam punk outfit holds his steam punk remote controlled dinosaur in a teapot vehicle called D-Rex. Vern Jensen checks the one inch thick strip of hickory bent to form the wheel rim for a Model T Ford. vintage car. 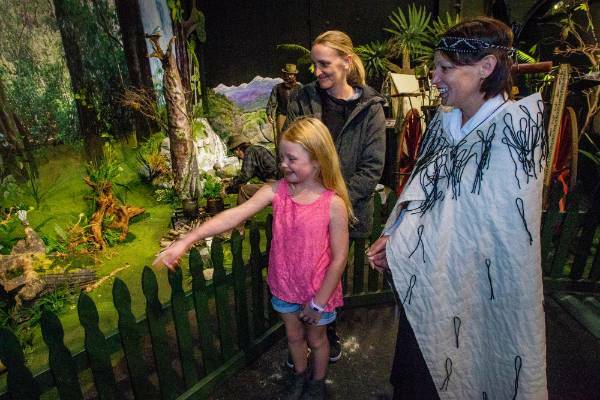 Sarah Holwell and her daughter Saskia Symonds, 7, explore the exhibits in the Coach House Museum with the help of the co-ordinator of the day?s activities, Piki Lowe (right). 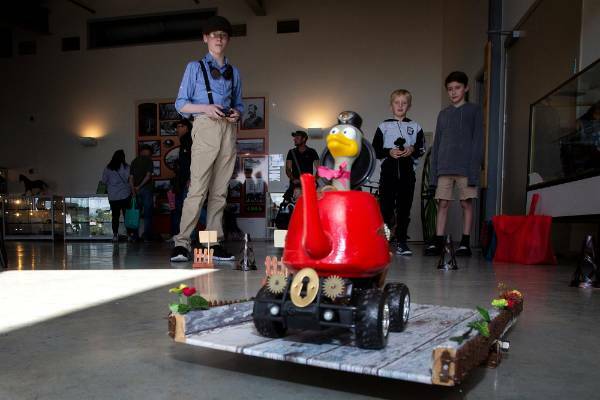 Ethan Shirriff from Woodville (left) demonstrates Duckalan, his remote controlled steam punk racing teapot. Hilton Digby (foreground) from Apiti and Vern Jensen demonstrate the wood bending process in the making of wooden wheels for a Model T Ford. vintage car. Jensen's skills are in hot demand with vintage car collectors. He sells his wheels all over the world, so the chance to get ahead with his work was a cheeky bonus. There's a real knack to getting it just right, but Jensen made the wheel-making process look deceptively simple. First, a length of wood is cut to size and boiled for five minutes. This makes the wood pliable enough to be bent around a solid circle, then clamped into place for another five minutes to make half a wheel. The two halves are then spoked and joined, before being fitted with a metal rim. 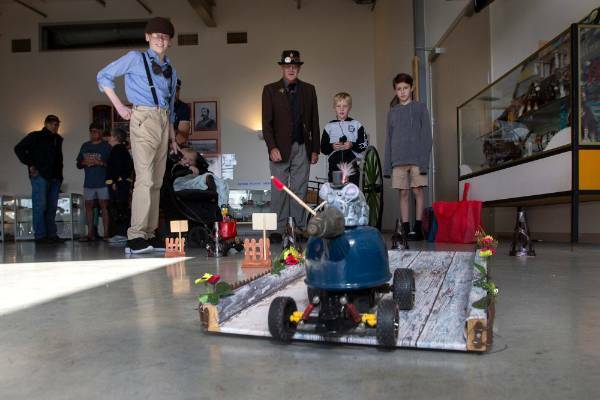 Museum administrator Piki Lowe said the biennial event was a fun way to give people a better idea of how the machines and artifacts in their static displays were used. "These skills are what built our community, and we started [Old Skills in Action] as a chance for people to get a hands-on education about our heritage." 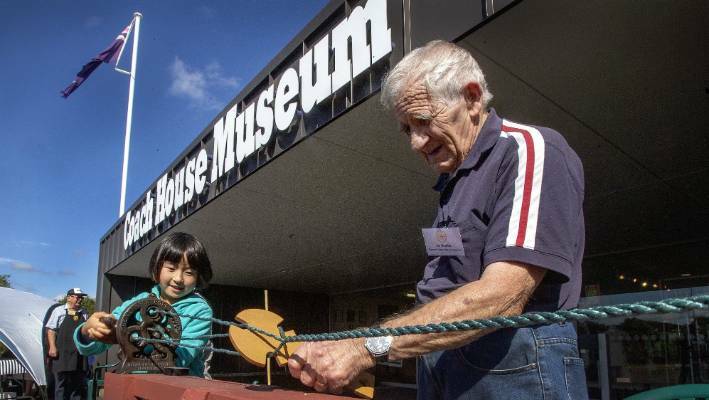 Koharu Tsutsumi, 8, from Palmerston North, tries her hand on an old-time rope platting machine, with museum custodian Joe Beattie. 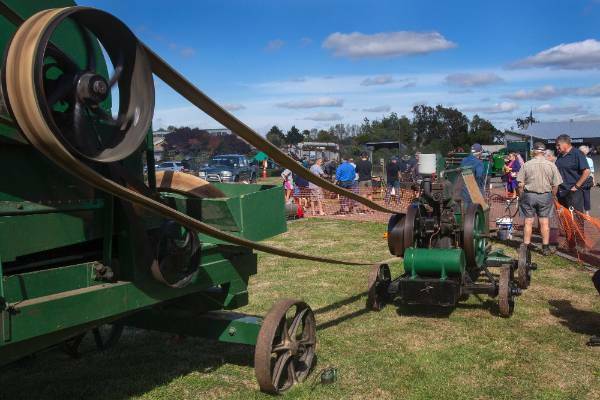 Other displays included traditional weaving, using both Māori and European methods, steam-powered tractors and farm equipment, vintage tractor and truck rides, and a small forge. Children got to play old games, like the horseshoe toss, or try out an old school laundry and washboard, and even a little well-supervised blacksmithing. 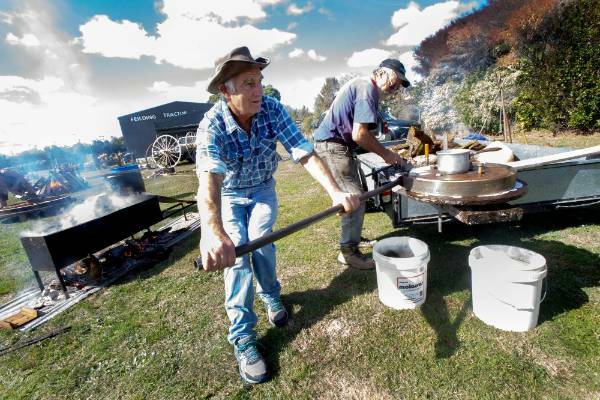 For those looking for a more personal connection to the past, volunteers from the Feilding and Districts Community Archive were on hand to help them find historical records and articles on their family, school or club.